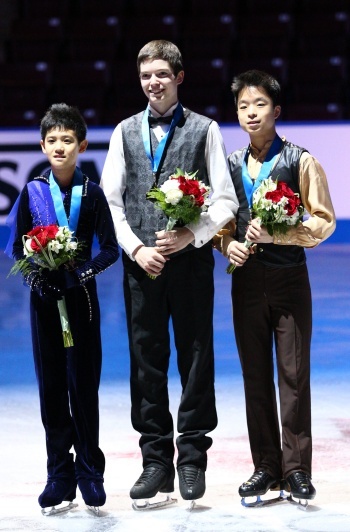 2013 Canadian National Figure Skating Championships: Men’s Novice from left to right: Eric Liu, Daniel-Olivier Boulanger-Trottier, and Antony Cheng. In the novice men’s division at the 2013 Canadian Tire National Figure Skating Championships, Daniel-Olivier Boulanger-Trottier (QC) not only maintained his lead after the short, but he also extended it to an eight-point margin over his closest competitor, Eric Liu (BC/YT). Antony Cheng (CO) took the bronze. Boulanger-Trottier had a fall on his triple flip, and it was apparent that he was anxious about it while waiting in the kiss and cry. In the end, however, there was no need to worry, and he pumped his fist when his score was revealed (83.62). Boulanger-Trottier clearly had a good feel for the music, but that is something that he does not share with his parents. Both of his parents are completely deaf, and he is trilingual, able to communicate well in French, English, and sign language. His ballroom dancing-themed program came complete with four separate characters and a number 32 on his back. Boulanger-Trottier scored a toal of 128.53 points. The novice men’s medalists included two more skaters with excellent musicality. Liu, the silver medalist (120.53), is just 11 years old, but showed maturity well beyond his years, something he picked up while studying piano at an early age. He would have loved a clean program, but fell on his second double Axel. Liu was fifth after the short program, and when he skated, his performance was easily the best of the night thus far, opening up a nearly 12-point gap over the next skater. Memories of Nam Nguyen’s novice title in 2010 were immediately conjured, but Liu is perhaps even more of a mature performer than Nguyen was at that age. Cheng skated directly after Liu and it was a close decision, but he wound up with the bronze medal. His Pirates of the Caribbean free skate was a marked contrast from Liu’s Rachmaninoff and in many ways, his performance seemed superior. Unfortunately, the 15-year-old dropped a whole spin from his score, and that made the difference between silver and bronze (120.18). Mitchell Brennan of Central Ontario came in fourth (108.79), followed by Adonis Wong (BC/YT) who scored 105.46 points. Overall, the night was not without mistakes, but engaging performers trying a variety of triple jumps made for an exciting event.